Prime Minister Narendra Modi on Sunday said India was marching from "Swaraj to Su-raj" and urged the 125 crore people to contribute towards creating a "New India". In his monthly radio address 'Mann Ki Baat', Modi exhorted all Indians to fight black money and corruption by opting for digital payments than cash transactions. Calling for continuing the war against corruption and black money, Modi said India can see 2.5 crore digital transactions within six months rather than wait for a year. "Within two months of its launch, there had been 1.5 crore downloads of BHIM app, this is commendable...," Modi said. "If 125 crore citizens make a resolution, then we can achieve the target of 2.5 crore digital transactions within six months and not wait for a year." He added that after the November 8 demonetisation of Rs 1,000 and Rs 500 notes, there had been a huge increase in digital transactions. "Just make sure you submit school fee of your children, do railway or airline bookings and other transactions through the digital mode," he said and enumerated government initiatives to promote digital payments. Modi also wished prosperity for Bangladesh on its Independence Day on March 26 and recalled the common memories of Nobel laureate Rabindra Nath Tagore shared by India and Bangladesh. He assured India's commitment as a strong partner of Bangladesh and asserted the two nations will work shoulder to shoulder in ensuring peace, security and progress. Modi, who earlier dubbed the March 11 assembly results in five states as the foundation for a "New India", called upon citizens to be more responsible and contribute in their own ways towards realizing the dream of a transformed India by 2022 -- the 75th year of independence. "New India is neither a government project nor a manifesto of a political party. It is the joint call and desire of 125 crore Indians to transform India. "Everything is not linked to the budget or government funds. If every citizen pledges to be more responsible, performs his duties, then this dream of a new and transformed India can be easily realised," he said. This was Modi's first radio address after the Bharatiya Janata Party took power in Uttar Pradesh and three other states. "Service is the core of our values. If we obey traffic rules, pledge not to use petrol or diesel once a week, resolve to be more responsible, if we do things step by step, we can achieve a new India," he said. Modi also paid tributes to martyrs Bhagat Singh, Sukhdev and Rajguru, reminded people about the immense enterprise and organisational skills of Mahatma Gandhi. "Year 2022 will be India's 75th year of independence; let's all remember Bhagat Singh, Rajguru and Sukhdev. Let us remember the Champaran movement and resolve to be disciplined in our journey from Swaraj to Su-raj." The Prime Minister expressed concern over food wastage and called on the nation to fight this. 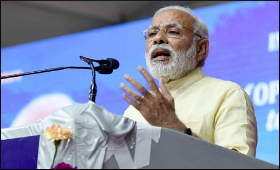 Ahead of the World Health Day on April 7, Modi stressed the need to change society's mindset towards "depression" and to encourage victims to speak up. He said depression was not an incurable ailment and one can get rid of it if a right psychological environment was built. Multifunctionals are low & high end devices that enable businesses to handle multiple tasks simultaneously. Cost efficiency, easy maintenance and operations, extra ordinary print quality and unbeatable speed are some of the most remarkable reasons to invest in a multifunctional.